This is a great cross! It measures 10" tall by 7" wide and has a hole in the back for hanging. 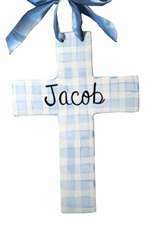 Each is hand-painted and can be personalized with name, birth date/baptism date, and personal message. These are perfect gifts to welcome a new baby, birthdays, baptisms/Christening gifts, and Christmas. The large plaid cross came in less than 2 weeks and it is adorable ! It is a very special gift that would be enjoyed and appreciated by any new parent !